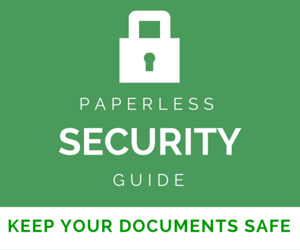 Some of us are looking to go paperless at home, and some of us are going paperless in a business. There’s a third category – those of us who do it both at home and at work. 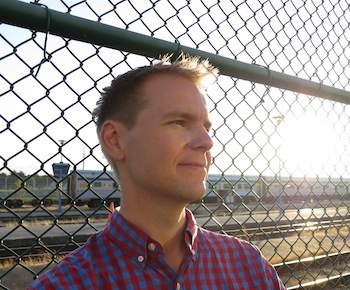 In these cases, giving some thought to your workflow and paperless structure becomes critical. This is the story of Douglas Tompson, who is also a member of this club. 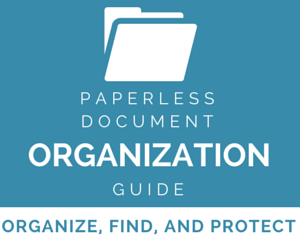 Doug shares his paperless challenges and solutions in this introductory article. Take it away, Douglas. I’m a self-employed, home based oilfield drilling consultant. My job involves being away from home for long stretches and returning home to a large pile of mail and a long list of Things To Do. Although oil rigs are often associated with rough workers and a dirty work environment, there is very little stereotyping with respect to the standardization and organization that takes place on a drilling rig. I’ve worked on rigs all over the world and the basic organization structure is almost always the same. I’ve also observed that successful rigs are well organized rigs. When I started my business, I desired the same clean structure and efficiency that is the hallmark of an efficient drilling rig operation. If we don’t need it, we get rid of it. Unfortunately, there are so many pieces of paper in running a business that have at least some small redeeming value. How could I run my business without drowning in all the paperwork that seemed to be required? My solution was to go paperless. My solution to my paperwork challenge was an aggressive approach to organization by committing financially to this important goal. Although I had a couple of laptops, I decided that if my goal was going to be fully achieved, I needed to commit completely instead of taking half measures. Although I could have simply bought an inexpensive scanner and loaded the software onto my laptop, I decided to build a dedicated scanning station in the middle of my paperwork chaos. 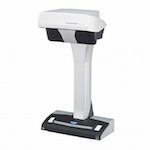 I understand that several thousand dollars for a scanning station might not be the ideal solution as a first step but I was convinced that if the paperless system was going to work, I wanted it installed on a fresh computer that wasn’t loaded with a bunch of clutter. Another concern was scanning all my valuable data onto a laptop that might break during my transient lifestyle bouncing around from oil rig to oil rig. Last but certainly not least, I wanted to build a scanning system that my wife could easily access and use while I was away from home. When I bought my Fujitsu ScanSnap, it wasn’t as common as today and it required special ordering. It seemed as expensive then as it may seem today but I decided that if I was going to fight the constant influx of paperwork, I needed to find the best tools on the market. Since no scanner is perfect, I also bought a nice big flatbed scanner for those items that can’t be fed into a document type scanner. When everything was plugged in, it looked like a menacing machine that was going to slay the paperwork disaster that was slowly but surely choking the life from me and my small home based business. I don’t think it will come as a shock to anyone that my relationship with my wife was much more difficult when we were drowning in paperwork. 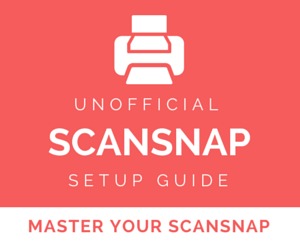 Buying a scanning set up and using a scanning set up are two entirely different things. After I’d loaded up all the software and installed all the updates, I had surely lost a full day of work in addition to the week or so that it took to order and deliver my desktop computer set up. The hardest part was learning how to run the scanner software and deciding on an organization system. I was immediately attracted to the Fujitsu Rack2-Filer system and although it has a few quirks, I continue to enjoy using it as my main platform for scanning. I learned the hard way with lot of initial mistakes. Eventually, I figured out the various steps but I sure wish there was a nice long step-by-step YouTube video series that could have saved me countless hours of grief. Starting with a brand new computer allowed me the luxury of having a blank paperless canvas. Going paperless is an investment that requires an initial commitment to learning the software and developing a system that fits your particular situation. My system might work for a co-worker but it won’t work for him unless he’s organized his company (and home) the same way that I’ve organized mine. The more thought that goes into the foundation of your system, the better it is able to deliver over the coming years. The scanning process will take a while to learn and I started with a dozen blank pieces of paper numbered 1–12. I wrote A on one side and B on the other side. These twelve sheets of paper became my initial learning blocks. Once I was able to scan a page, I tried scanning two pages. Once I was able to scan two pages, I tried scanning three pages and so forth. I learned how to scan one sided documents and I learned to adjust the settings to scan double sided documents. Eventually, I was ready to start scanning actual documents. At the time, my office was filled with paper so it was difficult to decide where to start. I must confess that I struggled to create a space for my newly purchased scanning equipment. My wife had spent a lot of time organizing the office while I was working and she had done a great job. Unfortunately, the paper kept rolling in. The binders that were carefully designed to accommodate various topics soon filled up. Once the binders were filled, new binders were added and we slowly started to run out of shelf space. Binders started getting wedged or stacked anywhere there was some free space. We had a binder for city taxes, a binder for phone bills, a binder for utility bills, several different binders for several different credit cards and so forth. I picked the smallest binder filled with natural gas bills and decided to tackle our problem one binder at a time. Although I used the Rack2-Filer system, the basic concept of going paperless remains the same. Decide on a system and start building it. I started with a folder (called a “Bookcase” in Rack2-Filer) that I named “The House” and then started building sub folders (called Binders) with titles like Phone, Insurance, Utilities, City Taxes, Natural Gas, Household Appliances and so forth. I spent hours scanning the contents of the binders but the rewards presented themselves immediately. Within a relatively short period of time, I was rewarded with an empty binder. One empty binder led to another and I was soon rewarded with a small stack of empty binders and a large volume of paperwork that had been scanned into our new dedicated scanning workstation computer. Once upon a time, I owned a portable electric shredder but I soon learned that the average heavy duty shredder is not suited for the volume of paperwork that a paperless office will generate. Instead of buying bigger and better shredders, I took a different approach. I designated a single box with a folding lid as my shredding box and made semi regular trips to a professional shredding company that offers shredding services on a per usage basis. Instead of wasting time feeding documents into a shredder, I throw them into the shredding box and pay about $20 every few months for a large duffle bag of paperwork to be shredded. As an added bonus, I sometimes find myself looking through the shredding box contents for a document that shouldn’t have been thrown in the shredding box. This option wouldn’t be available with a heavy duty cross-cut shredder. As a self-employed oilfield consultant, I’m also able to obtain a Certificate of Destruction when I drop off my shredding. I scan and forward this certificate to my clients with my invoice for services. This shredding certificate is yet another small, but significant, assurance that any work related paperwork is being discarded with their best interest in mind. Whatever industry you work in, the topic of due diligence is a common discussion and showing a respect for a client’s paperwork is never a bad way to distinguish yourself from your competition. Paying $20 every couple of months and getting a Certificate of Destruction is a much better option for my paperless office that a shredder that can only manage a few minutes of work without overheating. If I had a traditional office with employees, I’d have a shredding service come to the office as required and a single scanner collecting dust in the corner. My experience in going paperless has been very rewarding. The small initial collection of folders and sub folders has grown to become a much larger collection of folders and sub folders. I’m able to obtain a wealth of information based on a regular commitment to scan and save my important day-to-day documents. As an added bonus, my wife and I are delighted that the office has become much more useable since the large pile of binders has been given away to friends and relatives. Embracing a paperless lifestyle means scanning receipts or paperwork and saving them in whatever special sub folder you decide best answers your particular paperwork situation. When I started the folder titled “The House”, I also created a subfolder called “Household Appliances”. I started to make it a practice of scanning the first page of the Owner’s Manual with the purchase date, model information and serial number for long term reference. This scan is conveniently located next to purchase receipt. When our gas oven started causing us problems, my wife was delighted that I volunteered to coordinate the repair service to fix the problem. The reality was that this was a perfect opportunity to reap the rewards of our scanning workstation. My first step was to find the purchase receipt and learn that the extended warranty had expired. My second step was to email the purchase receipt with the gas stove make, model and serial number to the repair service company that specializes in our brand of gas oven. I didn’t have to waste time and money discussing what model of stove I had and the service team were able to come to the house with the proper troubleshooting manual downloaded into their laptop with the proper spare parts for the typical repair. When the repair was done, I scanned the service record into the “Household Appliance” subfolder next to the oven’s original purchase receipt. We enjoyed the oven for a couple of weeks before it started malfunctioning again. The repair process started again from the beginning although this time, I was able to ensure that the first round troubleshooting and repairs records were emailed to the service dispatcher. Since I was able to establish that the initial repair had not resolved the problem, our “Initial Consultation Fee” was waived for the second repair. I’m confident that our original office system would have devoured the initial work order receipt and it would have taken an obscene amount of time to locate it. 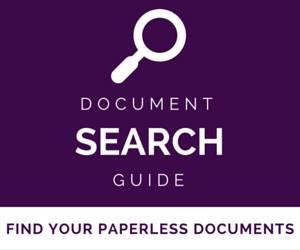 Our current paperless system allows the most obscure paperwork to be accessed within a few seconds. There is nothing that comes into our home or office that doesn’t get scanned and saved into a special folder. If the scanned item doesn’t meet the description of one of the countess folders available, a new folder is created. We recently sold our lovely 1988 Volvo 240DL and it included a USB flash drive containing all the maintenance records for the past few years, the major repairs from the previous owner, a PDF of the Owner’s Manual and various handy reference documents. The new owner was delighted that she was able to access all the vehicle’s oil changes, maintenance records and even a collection of business cards relating to the various local firms that have looked after the car. Going paperless has been a great investment that yields rewards at the most unusual occasions. I’ve got countless stories of triumph that could not have taken place without our decision to go paperless. No system is perfect and no system doesn’t require an investment of time and money. Our system is getting better and better as we learn more and more tips and tricks. Thanks for the wonderful true-life examples. I’m just beginning the paperless process and recently through out the repair records for my washing machine, but will keep them from now on!